I am considering the purchase of a Pantera. I am unsure if it would be smart to buy a total restoration project, or something partially complete, or 100% done. I restored a 1957 Chevy when I was in my twentys (a long time ago). I did partial restoration on a 1957 Corvette that I owned about ten years ago. I know very little about Panteras. I do know I love the look. Always have. Obviously the original car had some problems. I would assume that there is a list of must change improvements. Is there a good book that I can purchase that tells it all? It also appears to me that it can be cheaper purchasing a car complete! Any info or advice would be appreciated. It also appears to me that it can be cheaper purchasing a car complete! IMHO, you have already figured out the main point in a Pantera purchase. That is, if you can find the Pantera you want. You should check out the two websites in my signature below, hang with us here in the P.I. forum, and absorb info. There are a million ways to modify our cars, some good some not. You MUST get well educated in the ins and outs of these rust-prone Italian hot rods, or you risk getting seriously burned with a hasty Pantera Fever induced purchase. Do you want stock look, GRP4, GT5 or GT5S? Is color important? Do you care if it still has the Cleveland? Is it just for street fun, or track, too? Give us an idea of your budget and timetable. I would say current conditions should see you with at least $35K and at least 6 months of education and searching, talking, looking. 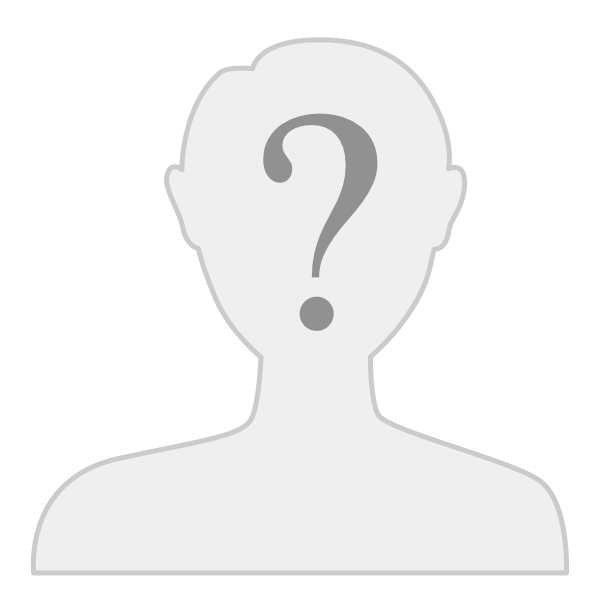 There are Texas owners that you should hook up with for greater insight. Welcome to the Family!! You are welcome here with all your questions, thoughts and puzzlement. We are here to help, just ask. Thanks for the reply. Guess I have a great deal to learn before purchase. Your car is beautiful. That is the level that I am looking for. Stock outside. Maybe a little more performance than the stock 351. Like the wheels. Did you do all the work yourself? No, I did as I now preach. I read ALL the old forum threads, I attended the Vegas Fun Rally twice, Concorso in Monterey twice, talked with about 40 sellers, looked at about 20 cars, and drove about 15 before finding 2511 on eBay. I then went 510 miles to view the car - with another local owner who had just finished his Euro GTS restoration, by himself - and then bantered price for another three months with the seller. About an 18 month process for me, but I got a bare-metal restored car, from Dennis Quella, with less than 5000 miles on it for less than the previous owner had in just the restoration receipts. I got the car in November of '02 for $42K. I doubt you can do the same in today's market unless you happen on the right deal before anyone else. And being in the Family will often let you know of a car prior to the owner actually listing it anywhere. This is where you can get a deal once and awhile. A lot of folks thought I was WAY too picky, just a tire kicker and took too long. They all fell in line when they saw what I wound up with. Read, ask questions and attend any event you can make it to. And look at ANY Pantera you can find, for sale or not, whether it is in your price range or worthy of your consideration. Your level of knowledge will be increased with each car. Take another owner with you for the first few if you can - after about six cars,several PCNC tech sessions and all my questions, I was pretty confident in my evaluation skills - but understanding a Pantera does take serious study. The Fever, as I call it, has hooked and hurt many before you. Take your time and do it right the first time. After a bit of reading I have determined that the number one concern seems to be RUST!! Seems they are a magnet for it. Second, "get a car with a good transmission". I guess they are extremely expensive to repair. Believe that it will take quite some time to find the right car. Thats ok.
With customizing so prevalent in the Pantera hobby it can be difficult for first-time shoppers to differentiate between the necessary improvements and those that are merely optional. Even owners intending to make only the essential improvements end up becoming side-tracked by the “customizing” bug. Here’s a list of Pantera upgrades which I consider essential; they correct its short-comings, they make it more reliable, they modernize its performance and they improve the ownership and driving experience. These upgrades are minimally intrusive to the original design. This guide was written predominantly for buyers and owners of the narrow body Ford specification Panteras sold between 1971 and 1974. However many of the considerations listed here apply to later model GTS and wide body Panteras too. The 351C was equipped with a unique high-flow thermostat and a unique high-flow warm-up system. 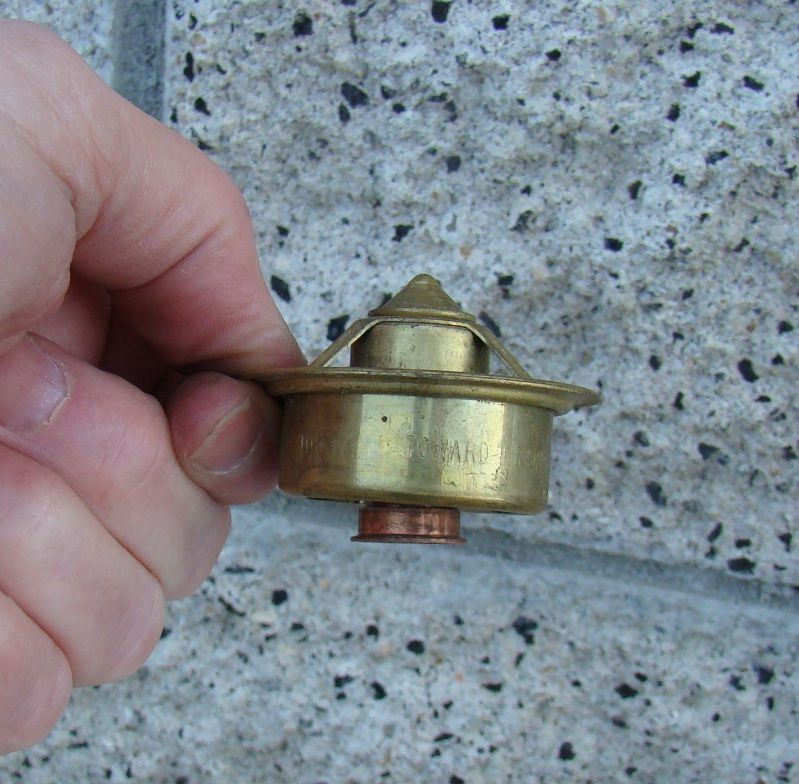 But almost all parts houses, including the parts counter at Ford dealerships, dispense the wrong thermostat for the 351C, they sell the Windsor themostat for Cleveland applications. Use of the wrong thermostat is by far the biggest source of Pantera cooling system trouble. Using the correct thermostat allows the warm-up system to operate properly and alleviates over-heating. is not helpful because it takes a more powerful motor to move substantial quantities of additional air. The oem radiator vent system is non-functional. Air that collects in the radiator has no way to vent and remains trapped in the radiator. This reduces the effective surface area of the radiator and leads to over-heating. However, the Pantera's cooling system has the proper tanks for a functional race car style vent system; it is obvious that during the early stages of the Pantera's genesis the application of the tanks was revised leaving the Pantera without the vent system intended for the radiator. A couple of simple modifications is all it takes to make the vent system functional as I believe the designer originally intended. The curved vane impeller of the Edelbrock pump eliminates cavitation which begins at 5000 rpm with the stock pump. This is worth about 5 extra BHP at 6000 rpm. But most importantly, the Edelbrock pump has a spare port connected to the pump suction that will allow plumbing the overflow tank to the pump suction as detailed in the picture above. This takes the load of the cooling fans off the ignition switch. This takes the load of the head lights off the ignition switch. This takes the load of the ignition off the ignition switch & supplies full voltage to the ignition. There is too much electrical current flowing through the contacts of the ignition switch, this was true even when the vehicle was new. Over the years those contacts have become dirty or worse, burned and pitted. But as we upgrade the Pantera with high air-flow cooling fans, brighter headlights, and electronic ignitions ... all these improvements draw even more electrical current, and severely overload the ignition switch contacts. Its imperative to install the relays and remove those loads from the ignition switch. The oem fuses are difficult if not impossible to find today. The connection of the oem fuses in the oem fuse hoders is also a source of electrical gremlins. Upgrading the fuse box to modern fuses simplifies fuse replacement, and eliminates the electrical gremlins that are created by bad fuse connections. The OEM headlamp is a 7” diameter, incandescent, sealed beam lamp with dual high and low beam elements, equivalent to a GE model 6012 lamp. Several brighter sealed beam headlamps have been manufactured over the years to replace the GE model 6012. The first replacement was the model 6014, which was a higher wattage incandescent lamp. The second replacement was the model H6014, a halogen version of the 6014. The model H6024 was another halogen replacement for the 6012, the H6024 evolved into the model H6024XV, a halogen lamp advertised to be both brighter and to have a longer life. The best option today however is manufactured by both Bosch & Hella. They each manufacture a 7” reflector to replace the model 6012 sealed beam headlamp. The reflector employs a modern H4 cartridge style halogen bulb. These reflector and cartridge bulb systems offer both brighter lighting and an improved light pattern. The headlamp wiring revision (#9) suggested above should be performed before installing the brighter headlamps since all of these brighter headlamps draw more current than the OEM headlamp. The OEM alternator is an externally regulated (i.e. rear terminal) Ford 1G small case alternator. Ford originally manufactured this alternator with outputs rated between 35 and 65 amps. 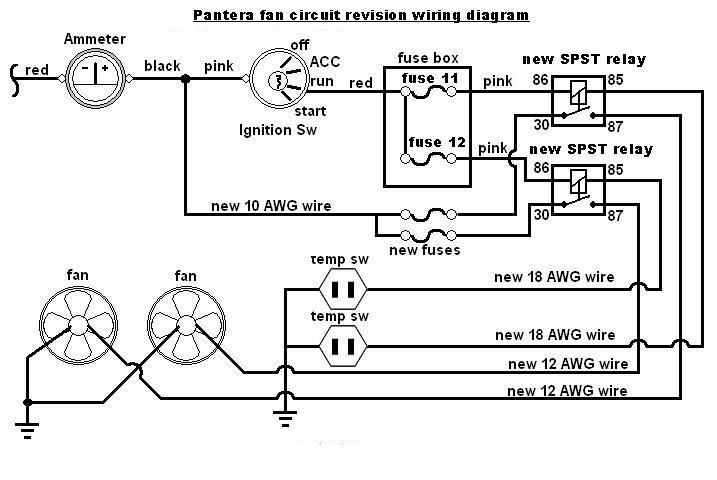 I have seen specs rating the Pantera's alternator anywhere from 44 amps to 61 amps. Remanufactured 1G small case alternators are available today with enhanced outputs boasting 80, 100 even 130 amps. The charging needs of a Pantera will hinge upon how much current draw the various upgrades have increased the load upon the electrical system (fans, headlights, ignition). An 80 amp 1G alternator combined with a solid state voltage regulator will provide more than enough charging capacity to handle the upgrades mentioned in this guide. There is no reason to convert to a 1 wire or 3 wire style alternator, and no reason to upgrade to an ultra-high-output alternator. The Pantera was originally equipped with a wonderful leather wrapped two spoke steering wheel manufactured by Ferrero. That steering wheel was the type of equipment you expected to find in the most expensive car sitting on a Lincoln dealer's lot. Tom Tjaarda had also designed some contoured and reclining seats that were forward thinking and ergonomically headed in the right direction. The seats provided generous head room and leg room for a wider range of driver heights (including taller drivers), and provided side support to keep the driver in his place during high speed cornering. The seats also had the appearance of seats designed for an expensive European mid-engine sports car, but they needed more development before they would be ready for production. Tom said the foam blocks became uncomfortable after about 20 minutes of driving, and the sides of the composite "shells" became irritating to the drivers side after a while. Ford replaced the Ferrero steering wheel with a cheap plastic steering wheel that was original equipment in one of Ford's least expensive imports ... the Capri. The seat design was abandoned for an upright, thinly padded, non-adjustable conventional seat that looked like it came out of a 1965 Mustang. The Pantera's ergonomics were compromised by these decisions, and people who log a lot of miles on their Panteras will appreciate improvements to the ergonomics. By the way, the composite shells for Tom Tjaardas seats were later employed as the shells for the racing seats installed in the Gp4 Panteras. This is not a necessity for every Pantera, but the bulkhead reduction kit is often needed to make room for an aftermarket passenger seat, and it improves passenger comfort if you plan to travel with an adult passenger. The axis of the transaxle output shafts is located behind the axis of the rear wheel stub axles, therefore the half shafts operate at a constant angle. This angle creates an angular side-thrusting force at the u-joints and the rear wheel bearings which they are not designed to sustain; thereby causing them to wear rapidly. The only thing that can be done is to use heavy duty parts that will slow down the rate of wear. The rear axles are supposed to have an interference fit within the rear wheel bearings, but many Panteras were equipped with slightly undersized axles. If the axles fit loosly within their bearings there is a chance the axle will spin within the inner bearing race, this will possibly wear away the axle making the axle's OD even smaller, it may wear stress rising grooves in the axle or gall the axle; in other words damage leading to axle failure may occur if this problem is not resolved. If the axle is undersized this problem should have been addressed the first time the rear wheel bearings were repaired. If the axle damage is minimal it can be repaired and steps can be taken to restore the proper OD in the bearing area. If axle damage is severe enough to weaken the axle the only recourse shall be to replace the axles. Combined with a properly adjusted and greased shift linkage, these are two improvements which can help the ZF shift buttery smooth. Every sports car or race car enthusiast must come to grips with the truth that the performance of any sports car or race car is limited in every way by the performance of the tires it is equipped with. Using the best tires possible should always be the desire of any sports car or race car owner. Acquiring 15" tires that have a V or Z speed rating, or that are capable of providing adhesion that is compatible with the capabilities the Pantera's chassis, is a difficult if not impossible task. Modern high performance tires exceed the performance of older tires in every aspect, but this modern technology has never been applied to 15" tires. Tire manufacturers have abandoned owners of sports cars equipped with 15" performance tires. The best a Pantera owner can expect from a tire manufacturer is to reproduce a tire design that is 30 to 40 years old. An upgrade to modern wheel and tire sizes is needed in order to modernize the performance of any Pantera, and to make state-of-the-art tires readily available to Pantera owners. Some owners desire to maintain the oem appearance of the original wheels and tires. My advice to those owners is to upgrade the wheels and tires they use for normal driving duty, and to keep their set of oem tires and wheels stacked in the corner of the garage for concours type car shows, and to pass-on to future owners. If they prefer the oem Campagnolo appearance for the wheels they use for normal driving, they should equip their Panteras with "Campy Clone" type wheels in modern wheel sizes and have them powder coated in the oem silver color. If you want Campy Clone wheels but the Pantera vendors can’t supply them in the sizes you want, take your business to Genuine Boyds, they will make Campy Clone wheels to your specification. Staggering the diameter of the front wheels and rear wheels by 1 inch or 2 inches compliments the looks of the narrow body Pantera very well. The recommended 275/285 cross-section rear tires mounted on 18 inch, 19 inch and 20 inch wheels are the correct outside diameter for a narrow body Pantera, therefore the gearing is slightly higher and the gear spacing is slightly wider than with the 17 inch rear tires. The outside diameter of the 18 inch, 19 inch and 20 inch rear tires also compliment the radius of the rear wheel well, and they provide the proper revs per mile for speedometer and odometer accuracy. The narrower 275/285 cross-section tires have several advantages over 335 cross-section tires, including: (1) there are more choices in tire makers and models, (2) obsolescence is not an issue, and (3) they are significantly less expensive. Although not a selling point for every Pantera owner, the narrower 275/285 cross-section tires are also available in all season rubber compounds; owners who drive in conditions where such tires would be beneficial may find that another valid reason for selecting the narrower tires. (27) Remove the proportioning valve from the brake system front circuit. (28) Replace the front rotors (disks) with ventillated rotors. Warning: removal of the proportioning valve from the front brake circuit will worsen the front brake overheating problem, therefore replacement of the front solid rotors with ventillated rotors should be performed in conjunction with removal of the proportioning valve. The Pantera is equipped with good Girling 4 piston fixed calipers in the front, but small Girling floating calipers with only a single piston are installed at the rear, the brakes are significantly under-powered in the rear and rear braking force is unbalanced with front braking force. The 11” (280 mm) diameter rotors are only ¾” thick, and they lack ventilation (they are solid disks). When subjected to repeat hard braking the Pantera’s braking performance quickly fades due to heat. Instead of installing ventillated rotors and more powerful rear brake calipers Ford specified installation of a proportioning valve in the front circuit to reduce front braking force and therefore reduce the heat generated by the front brakes. The proportioning valve in the front circuit prevents the “good” calipers from gripping the front disks with full force during hard braking, when full force is needed most. Ford believed the neutral steer built into Pantera chassis was dangerous for the average driver, they believed the mid-engine Pantera was too easy to transition into a condition of oversteer. Therefore Ford decreased the size of the rear anti-sway-bar from about 7/8" to 3/4" to give the chassis a bit of understeer thereby lessening the chances of over-steer. Unfortunately this had a negative impact on the Pantera chassis' ultimate cornering capabilities. The oem suspension used rubber bushings in the anti-sway-bar mounting system for both the chassis mounting points and the lower control arm attachment points. The method in which the anti-sway bars attached to control arms demanded a lot of "give" in the design, which was provided by the rubber bushings. When an owner replaces the rubber anti-sway bar bushings with poly-urethane bushings the "give" in the design is eliminated, a degree of binding is introduced into the suspension, the anti-sway bar mountng straps and the anti-sway bars themselves begin to snap in two. To give the anti-sway bars more control over the chassis while preventing the parts from being snapped in two requires an upgrade to the anti-sway bar attachment parts. Ford raised the ride height of the Pantera to enable it to negotiate severely poor road conditions and large road hazards; raising the ride height also raised the bumpers to better match with the bumper height of other cars on the road. But raising the Pantera negatively impacted the handling. Lowering the Pantera's chassis improves its handling tremendously, and also improves its appearance. Lowering the nose of the Pantera in relation to the rear modernizes its apperance and improves the aerodynamics. But as a chassis is lowered it has less suspension travel, therefore it is important to increase the compression rate of the springs (rated in pounds per inch) in order to prevent the chassis or suspension from bottoming out when encountering high speed bumps. The rear end of a Pantera should be lowered until the half shafts are parallel to the ground. This optimizes the angle at which the u-joints operate, to minimize the load on the u-joints and rear wheel bearings. The front end of the Pantera should then be lowered to level the door sills, or to give the front end a visible "nose down" appearance. Lowering the front of the Pantera is limited by the ability to get a floor jack under the front jacking points, or by the Pantera's ability to clear road obstacles, deep rain gutters, steep driveways, etc. The oem shock absorbers were not the best choice available at the time, red-body Koni shocks were the common upgrade 40 years ago. Of course there are even better shocks available today than the red-body Konis that were available in the 1970s. If replacement shocks are purchased having spring pre-load adjusters the ride height of the chassis can be improved in conjunction with an improvement to the shock absorbers. The Pantera was designed with 2.6° of positive caster built into the chassis. The caster is fixed, its not adjustable. The caster however is not consistent from car to car, or even from side to side of the same car; it varies by a surprising amount. The caster is also dependent upon the relationship between the front ride height and rear ride height of the chassis. The more the front of the car is lowered in relation to the rear, the less caster there is. Lowering the front end of the car as suggested above will eliminate any positive caster in the front suspension geometry and make the the car handle very "twitchy". It is the consensus that 4° to 5° of positive caster is about the right amount for a narrow body Pantera, however to achieve this much front caster requires modification of the upper front control arms to allow moving the upper ball joint further back, and to allow shimming the ball joint to achieve the proper setting. The box-section sub-frame that supports the engine and rear suspension is not braced to resist verticle or twisting forces very well. The result is paint chipping and body panel cracking in the rear section of the car, and even cracking where the A-pillars attach to the front cowl. Race cars require substantial bracing to fix this, but street cars are greatly aided by the bolt-on braces (stiffeners) sold by the Pantera vendors. To re-fuel the earliest Panteras (predominantly Push-button and Pre-L models) it was necessary to open the engine compartment hood and wrestle the fuel pump nozzle into the short verticle fuel filler mounted atop the fuel tank. Hall Pantera sells an extended and angled fuel filler neck that makes the chore of refueling much easier. The threads pull out of the OEM rod nuts. The rod nuts can be replaced without a complete tear-down of the motor. The big-ends of the connecting rods do not have to be resized if the connecting rod bolts are not removed. M code and Q code dampers were always considered inadequate for high performance applications. But the concern today is the damper ring may fly off the hub due to the damper's age. The 40 year old cast iron flywheel could be a ticking time bomb. A lightened steel flywheel is tougher than the oem iron flywheel, and the lighter weight will give the motor a little more pep. As far as I know the Yella Terra flywheel is the lightest 11 inch, 164 tooth ring gear, SFI approved billet steel flywheel on the market. It is drilled for long style pressure plates, which is the type of clutch I recommend. And it is configured for external balance applications (28 oz. imbalance). The engine runs smoother, makes more power, revs to higher rpm, and there are no more points to adjust. (51) Replace the camshaft timing set with a Roll Master #CS 3091 timing set. The plastic teeth on the oem camshaft timing gear have to be shot by now, and the chain stretched. The multi-groove timing sprocket will allow you to advance the camshaft timing of your 1972 - 1974 Q code motor to 1971 specs (4°). As others have said, lots of good info here, and we're all willing to help you find the right car. Read all you can, ask lots of questions, and look at as many cars as you can. Welcome to the fun, I knew where my car was for 20 years before I bought it 12 years ago. I never looked anywhere I just waited until my friend wanted to sell it it was bone stock. IMHO rust is the first and foremost thing to look for. Check out this link to the Pantera Place page, print it out, and take it with you to look at any car you are thinking about. (http://www.panteraplace.com/page57.htm) The website is a treasure check it out and yes the trans would be the next thing to look at. if you want to see a fairly stock car(mine) with just a few upgrades and it would be in the reasonable price range hit the specific forum here and search for 6656... Mine is not for sale but I have seen some that would be a great deal for a good price. If you get a solid car and don't mind wrenching on it(to me that is why I own it) you can get a deal. Good luck in your search and check out this whole site any help I can be just ask. Everyone here is very helpful. Mark, Larry was serious when he said "Welcome to the family". We routinely help new guys find a Pantera, evaluate possibles and even help you fix it yourself oce you've found your dream car, maybe with expert help. POCA started what's now called the "Tech Session" some 20 years ago, and as an example, one owner with severe arthritus that prevented him crawling under his machine, bought a car with a damaged ZF transaxle and a leaking gas tank. He made a few contacts, cooked up a big pot of chili and bought a case of beer and pop. 6 of us showed up at his home one rainy Saturday morning (one from 100 miles away). By 5PM, we had pulled the engine and ZF, pulled the gas tank, replaced the tank and ZF with rebuilts (that he'd located), corrected a couple of wiring problems and reinstalled everything for a successful test drive. No charge except there wasn't much chili or beer left... and he learned a ton on his own car as he watched us. I suggest attending the POCA Fun Rally in Reno next month (June 8-12, 2011). There will be some 120 Panteras in atendance, no two identical. Bring your camera. You will be able to get a ride around Reno-Fernley race track in someone's car, and possibly even drive one- most of us do not regard our cars as religious icons, so such stuff happens regularly. If interested, send me a PM (so as not to use up bandwidth here) and I'll e-mail you an entry form. Did I mention the 16-hrs/day free bar at the Circus Circus Hotel? and I did it all by myself add a great paint job $$$$$$$$$$$ well now your getting the picture, the nice thing about this car is you can spread the improvements over time. After all is said and done I would not sell my car for a million well maybe but I would just go out and get another one, that's love. Anybody else near Houston want to hang out? Any goings on or not to miss? To Joe...what part of Houston will you be in. Ooops, somehow my signature appeared on a bill of sale today, even after I told my wife I was only going to go to the dealership to look. I promised I wouldn't buy anything. Guess she gets that new kitchen she's been nagging me for five years. It is a 1974 L, fully restored, 48,000 miles with what I would call tastefull modifications. vin ending in 6591. Can anyone tell me if they know anything about this car? Also, the 351 was replaced with a bored out 351, but the old engine was crated and included. Is there any real reason to keep the old engine? It was apparently running when the new one was put in. Also it has four nice shiny chrome wheels. The old ones were included, they look pretty beat up, do they have any value? Can anyone tell me if they know anything about this car? Yes. It's on the Provamo Site - It looks pretty sharp. Congrats. Also, the 351 was replaced with a bored out 351, but the old engine was crated and included. Is there any real reason to keep the old engine? Yes. It's the original "matching numbers" motor. You might want to rebuild it to 700 HP someday. Also it has four nice shiny chrome wheels. The old ones were included, they look pretty beat up, do they have any value? Yes. Watch what wheels sell for on this board, and on eBay. Is there a printer friendly version of the 54? A .pdf file or Word version? What is "the 54"? Not sure what you're asking for a printout of. Yes. It's the original "matching numbers" motor. To clarify, most engine blocks received a four digit number stamped by DeTomaso on the upper, left rear of the block, just below where the cylinder head mounts. If you see such a number, then, yes, keep the block. Otherwise, just a run of the mill Cleveland block. But those are increasingly rare, especially if cylinders are still standard 4" bore. The car has just come back from a respray and whilst its stripped I intend to modify the wiring to the headlights and fan motors as excellently explained earlier in this post. Headlights and fan motors modification is pretty simple. However I also want to add the fuse and relay to the ignition system. Questions: The L/B wire from the ignition switch (resistor) originally to the +ve side of the coil and now to 86 on the new relay, is this still required? On the new relay, the feed coming from 87 does this now go to the +ve side of the coil. Not sure what is meant by "12v supply to new ignition"
The starter relay is only energized when you're starting the car, the ignition obviously needs power from that new "ignition supply relay" when the engine is running as well. Therefore power from the starter relay would not be a good source for activating the new ignition supply relay. Switched 12V power from the new ignition supply relay is used to supply any portion of the new ignition requiring a switched source of 12V power; the coil, the module, etc.. So I will re route the L/B from the ignition switch to 86 on the new relay, then from 87 on the new relay to the +ve side of the coil. What purpose then does the Orange wire do also from the +ve side of the coil to the starter as per the original wiring diagram. With the breaker point ignition the voltage supplied to the ignition coil during normal operation passed through a ballast resistor which more or less dropped the voltage down to about 50%, the coil operated on about 7 volts. The orange wire temporarily supplied the ignition coil with full 12 volts (no ballast resistance) during starting, to help start the engine quickly. If a 7 volt coil is supplied 12 volts full time it would quickly fail due to heat, but for a few seconds during starting its OK. Since your new ignition runs on full voltage full time, the extra wire to boost starting voltage to the ignition coil is unnecessary.